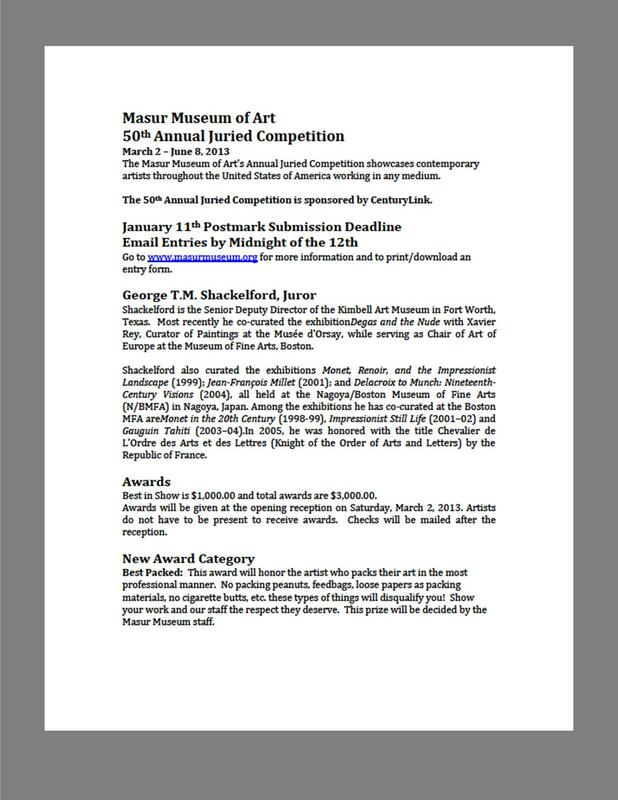 The Masur Museum of Art in Monroe, Louisiana, is taking applications for its 50th Annual Juried Competition. The Juror is George T.M. Shackelford, the Senior Deputy Director of the Kimbell Art Museum in Fort Worth, Texas. Any time there's a Call for Entries, the first question is "What's the deadline?" and the next is "Are there cash awards?" The exhibition gives monetary awards, including Best in Show for $1000, with a new award created this year for the Best Packed. Total awards equal $3000. The link gives all the juicy and necessary details. Follow this link to see all the information. This is a national exhibition, right here in our region, so get those applications in! Let's get a good representation of artists from north central Louisiana into the Museum. Having entered and attended the competition for years, it's really a great feeling seeing all the work from our area that's accepted into the exhibition each year. Artists from around the country enter this competition. Of course the juror-process is anonymous, which shows the caliber of artists we have working in our region. So don't procrastinate, follow the link and get your application ready. Is your New Year's Resolution to enter more competitions, to exhibit your work more, to add some lines to your artist resume? Well what a great opportunity to start off the new year, with a national competition right here in our own back yard. Now for a local competition: Union Parish Arts Council is accepting entries for their Competitive Art Exhibition. This is open to Union Parish residents only. There are details about the event on this link. Entries should be submitted for judging on Friday, Nov. 30, from 11 a.m. to 2 p.m.; the public exhibit will be the next day, from 10 a.m. to 4 p.m. There are ribbons and cash awards for adult winners, ribbons and gift cards for youth. A portion of the proceeds from the adult entry fees will go to the Farmerville High School art program. The juror for the competition is Dr. Joni Noble, Associate Professor of Art from the University of Louisiana at Monroe. More details about the Union Arts Council can be found here. Newer PostHave you looked at the calendar? !